Microsoft Project 2010 Professional has many features that will aid in effective project management. This includes allowing users to zoom in and out quickly to change the perspective of timelines and schedules and the incorporation of Microsoft Backstage as a way to access tools, templates and program options. The open license option is perfect for businesses that are projecting growth and the need for additional installations of the software at a later date. Open licenses are designed for businesses with two to 250 computers and installations can be done on an as-needed basis. Project Professional 2010 allows users to save files to SharePoint and gives them the ability to convert SharePoint Foundation 2010 task lists into a Project schedule. 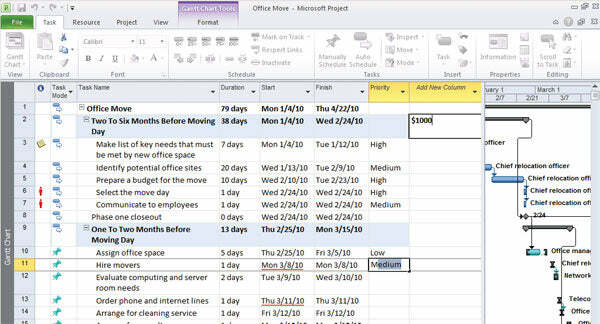 Synchronization of project schedules that use SharePoint is also possible as task updates from team members can be received and automatically synched to the project schedule. Style-wise, Project 2010 includes the Ribbon tab interface to find and use the software features and controls. This is the same tab type than can be seen in Word, Excel and PowerPoint and this familiarity should allow new Project users to become more easily acclimated to using Project. Microsoft Project Professional 2010 is a project managing software which gives Microsoft project managers a new and easier way to manage projects. With significant updates and visual enhancements, this project manager software delivers better experiences to simply be more productive and successfully complete all types of projects. Work more efficiently with the simple and intuitive Microsoft Fluent user interface?new graphical menus and a familiar experience provide the tools you need to plan and manage your project.